Special note on Honda and Acura. The factory code is located in the lower right hand corner of your color tag. (The color tag is usually located on the drivers door jamb, but if you don't see it, take a look on the passenger side door jamb.) For example, the color below would be listed on our site as B-89P. When you select factory code A from the drop down list of factory codes on our site, the color code becomes B-89-A which is not the same color as B-89. For accurate colors, please enter this letter or number! If you do not see a factory code on your color tag, please use the 11th digit of your VIN. 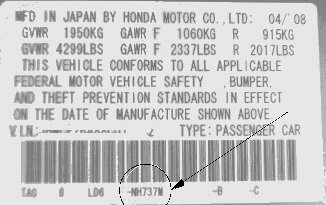 Many Honda and Acura vehicles will not have a factory code. Again, enter the 11th digit of your VIN so we can properly formulate your paint. If you have a factory code on your door jamb and it does not match the 11th digit of your VIN, use the 11th digit of your VIN. On some color tags the factory designation is part of the color code. For example, if your paint code reads B-89P-3, then the -3 is your factory code and MUST be entered in the factory code box on the order form.